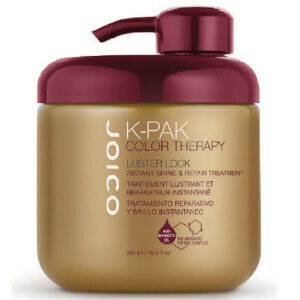 Restore radiant, healthy-looking hair with the K-Pak Color Therapy Luster Lock Instant Shine and Repair Treatment from Joico. Harnessing the powers of deeply nourishing Manketti and Argan Oils, the restorative formula can be used to add mirror-like shine to dull locks, or as a pre-shampoo treatment for intense repair and protection. Ideal for colour-treated hair, from blondes to brunettes and lowlights to highlights, its unique QuadraBond Peptide Complex seals the hair's outer layer to lock in colour vibrancy, whilst a luxurious blend of Silk, Soy and Seaweed Extract shield against heat styling damage. Expect hydrated, revitalised locks with a smooth, glossy finish. Apply to dry hair as a pre-shampoo treatment for an extra boost of repair and protection. 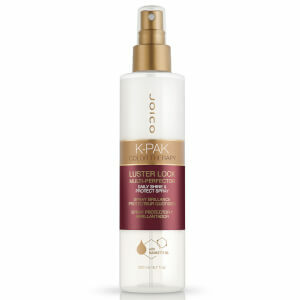 Or treat clean, damp hair to a dollop of Luster Lock, then rinse, dry, and style as usual. Perfect for fine or thick hair.